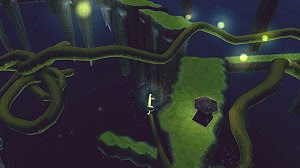 Dreamside Maroon is a whimsical, exploration-based adventure, following a timid maroon on a journey to the moon, aided by a hearty vine. Aster, the protagonist, sets out on a journey to the moon. The player guides this adventurous blue character, who rides a vine in order to travel upward. Aster's lantern is used to direct the growth of this vine, and growing twisted, interesting shapes will attract fireflies. Collecting these fireflies will bestow a momentary speed boost. As Aster travels further and further, he will collect a variety of experiences, told in a unique storybook manner.